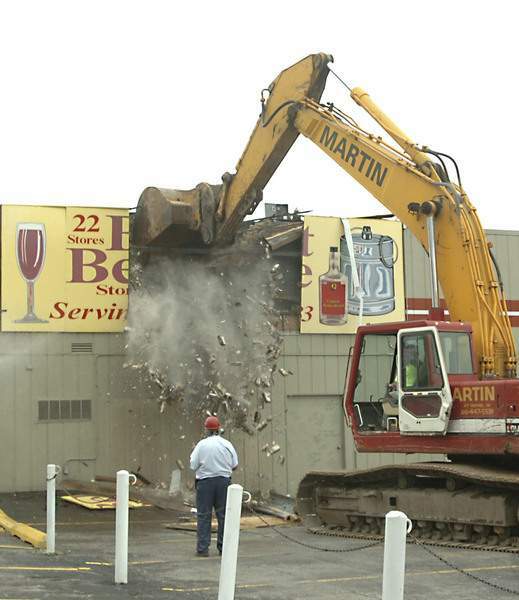 File On July 26, 2007, a Belmont Beverage store was the first demolition project to make way for the Harrison Square development. 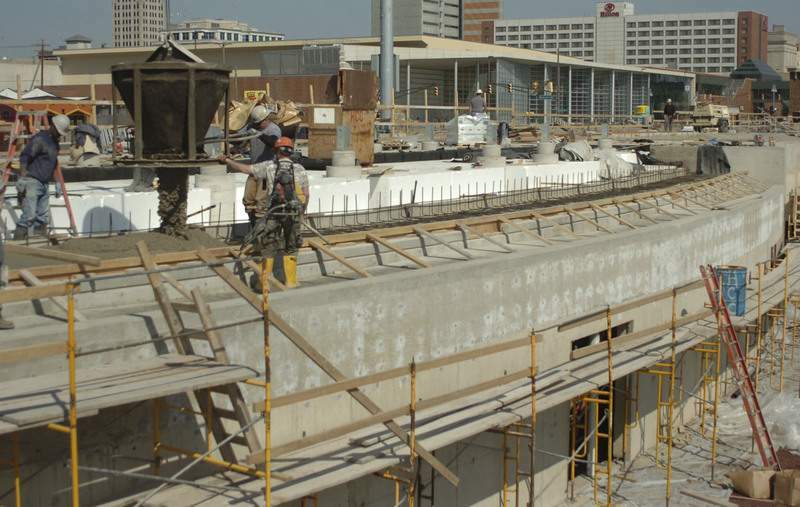 File Construction work continues at the future site of Harrison Square in November 2007. 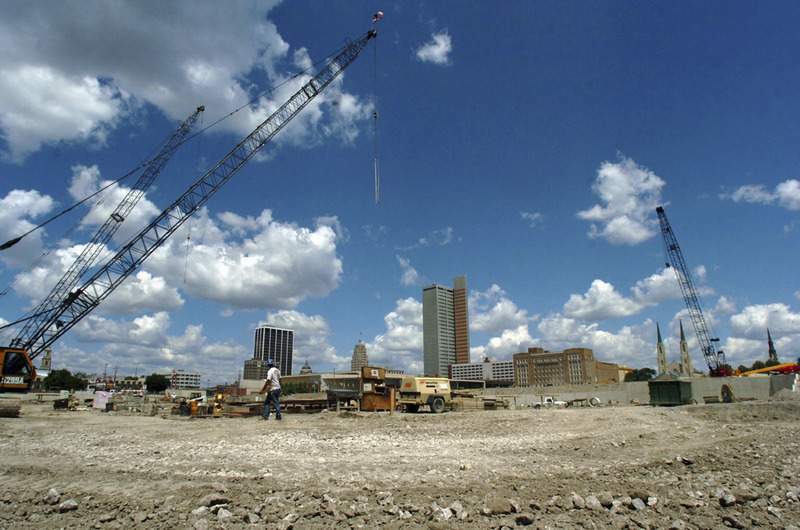 File Work is done to clear space for the Harrison Square downtown development in May 2008. 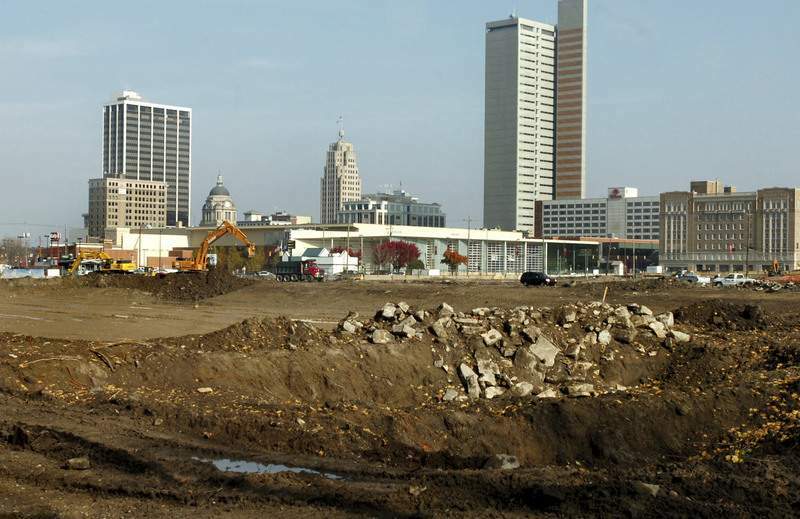 File Looking northeast at the Harrison Square project on May 13, 2008, where Parkview Field would take shape. 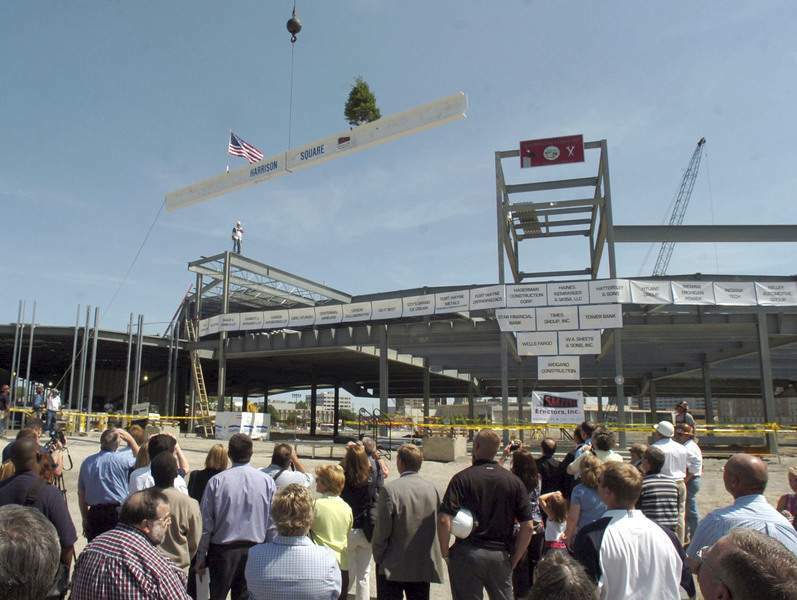 File Politicians, members of the public, construction workers, Fort Wayne Wizards' staff and ballplayers and others witness the topping off of Harrison Square stadium, July 1, 2008. All were invited to sign the steel beam which was lifted to the highest point in the stadium. File A view from behind home plate on July 23, 2008, as work continues on the downtown ballpark. File Construction on the main gate of Parkview Field, Oct. 6, 2008. 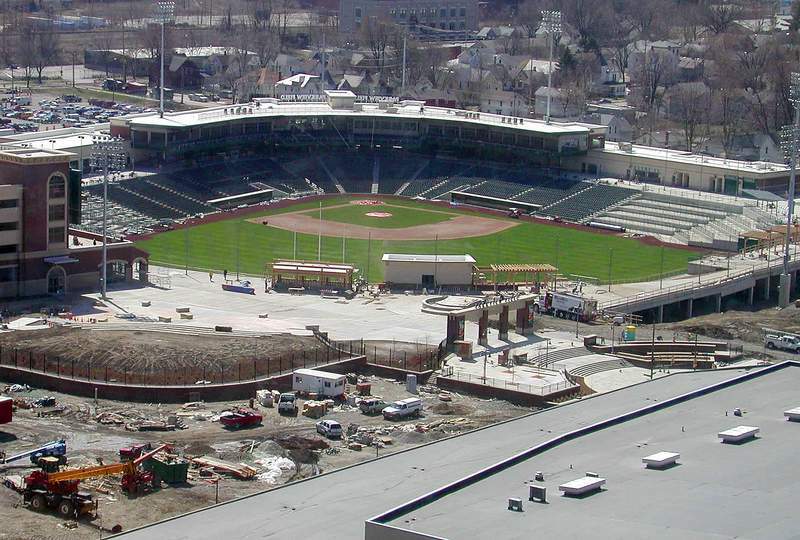 File Work continues on Parkview Field, Oct. 6, 2008. 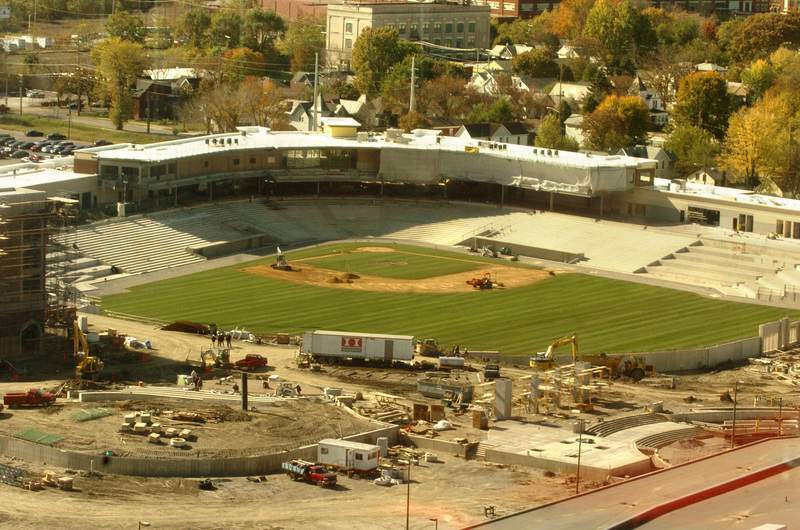 File Workers with Motz Group install sod on the field Oct. 13, 2008. File A view of work being done on Parkview Field on Oct. 22, 2008. 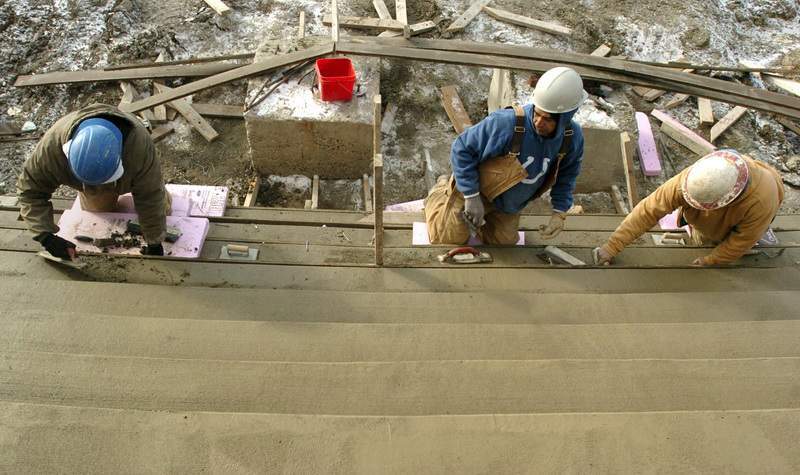 File Hagerman Construction concrete finishers work on the stairs in front of Parkview Field on Dec. 31, 2008. 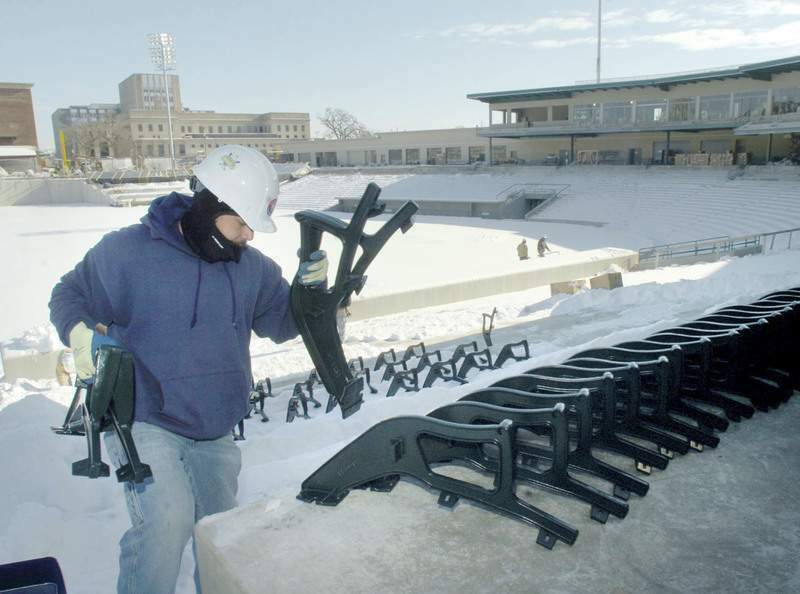 File Jesus Garcia and a crew from Irwin Seating Company began assembly and installation of the 6,000 seats in Parkview Field on Jan. 21, 2009. 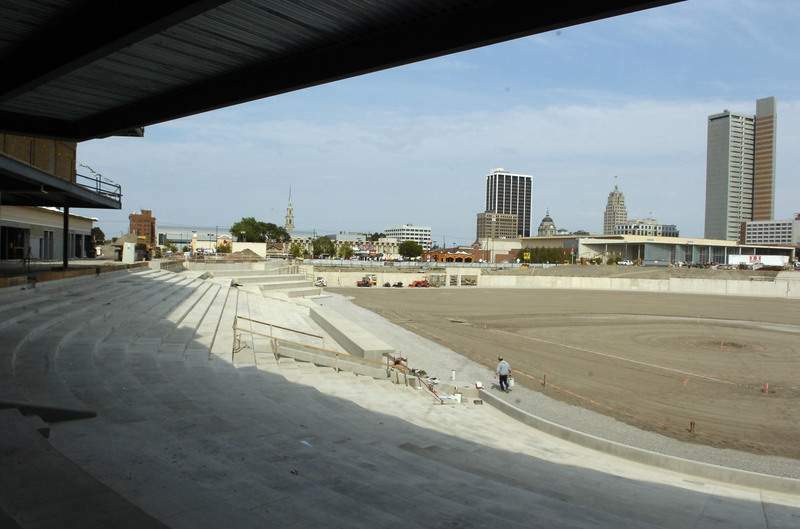 File In February 2009, a tarp covers the grass and most of the seats have been installed at Parkview Field. 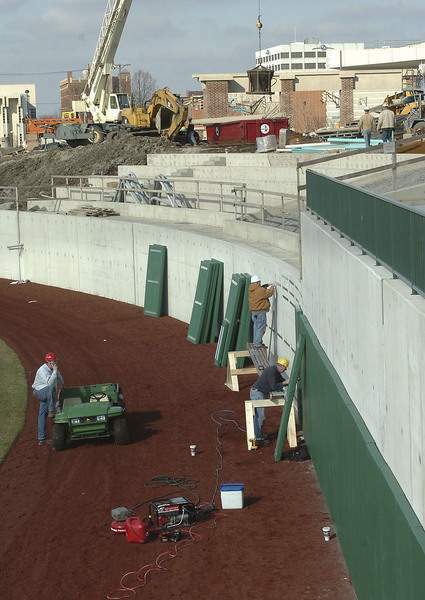 File Contractors install padding on the right field wall at Parkview Field, Feb. 13, 2009. 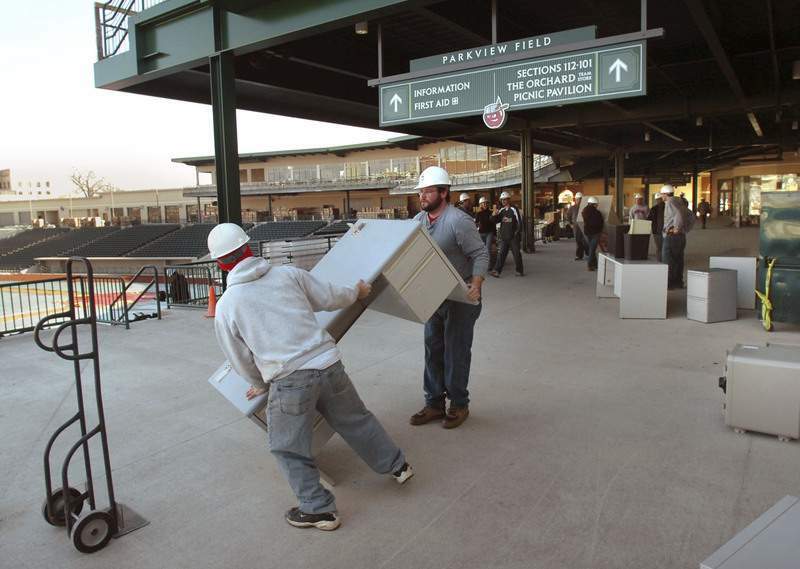 File TinCaps staffers Dan Watson, left, and Justin Shurley unload a desk on the concourse at Parkview Field on Feb 13, 2009. The team management was moving into their new offices downtown. 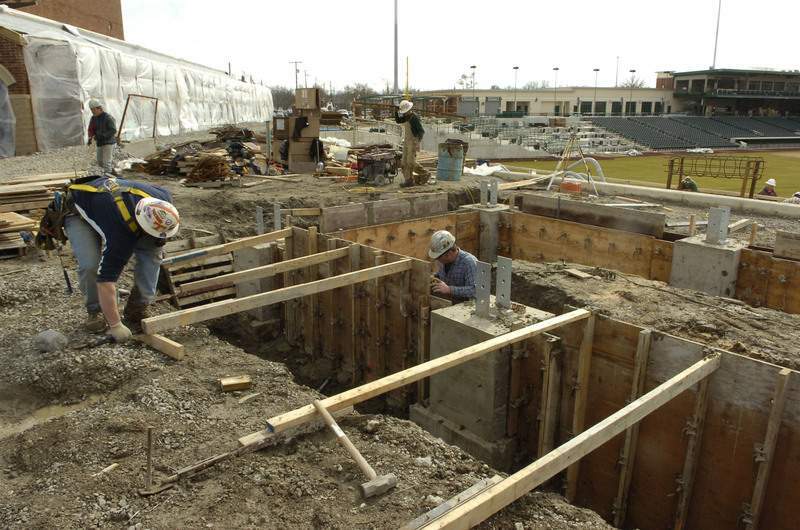 File On March 9, 2009, crews begin work on the outfield bar at Parkview Field after approval was given for its liquor license. 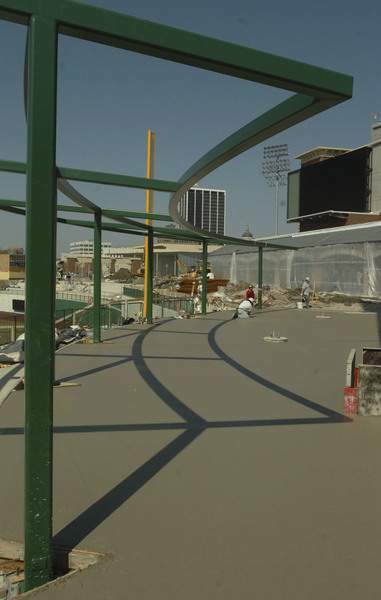 File Work continues on the left field wall of Parkview Field, March 16, 2009. 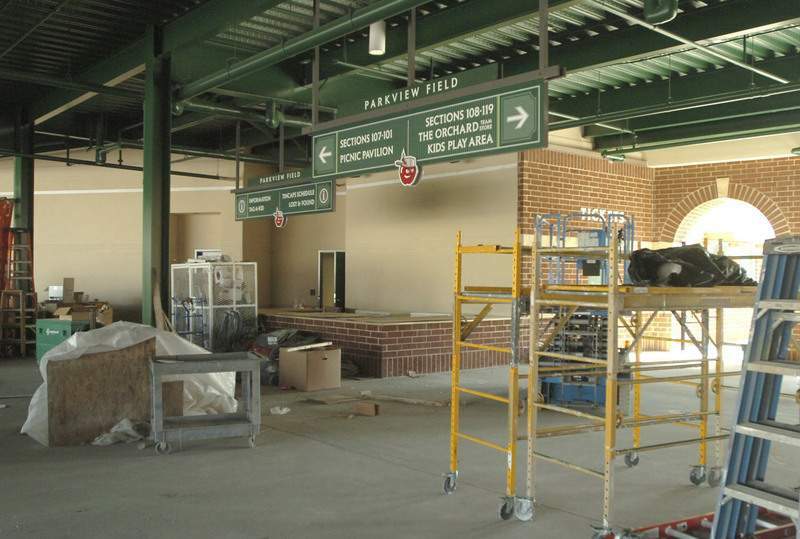 File Work continues on the Parkview Field concourse as opening day nears, March 16, 2009. File Wet cement on the right field concourse March 16, 2009. 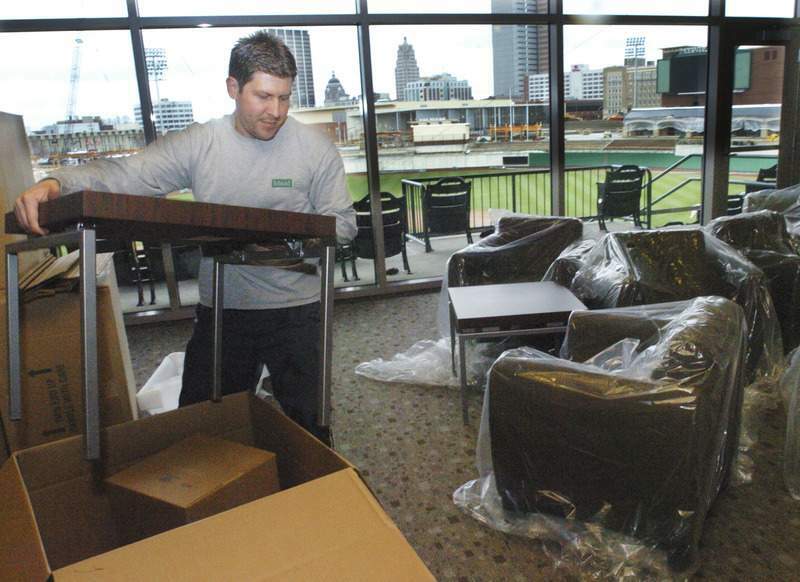 File Gary Wohlwend, owner of Ideal Office Source, unboxes furniture for the suites at Parkview Field as finishing touches are made on March 29, 2009. File A view of Parkview Field on March 30, 2009. 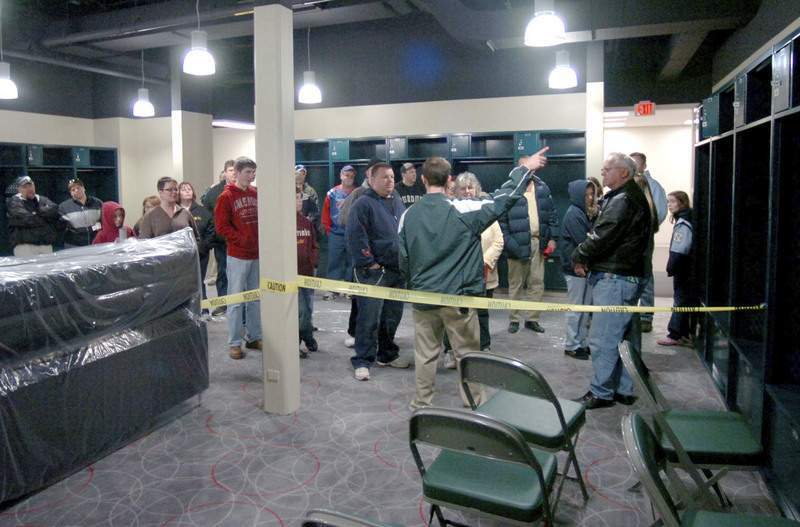 File A tour group visits the TinCaps clubhouse during a Parkview Field open house on April 4, 2009. 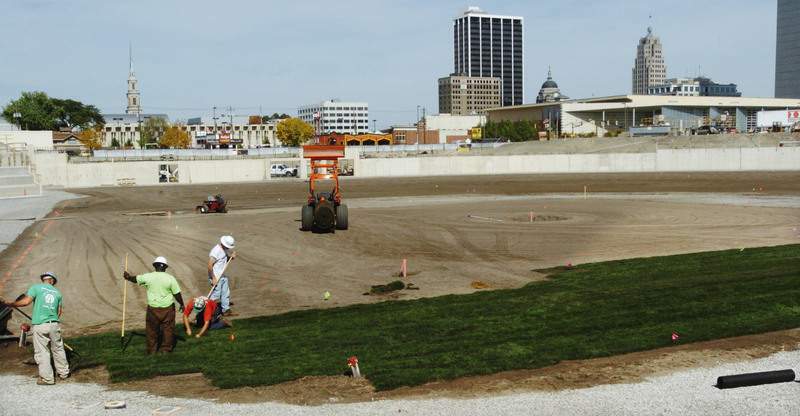 File Crews put the finishing touches on Parkview Field on April 15, 2009, a day before the first TinCaps game. 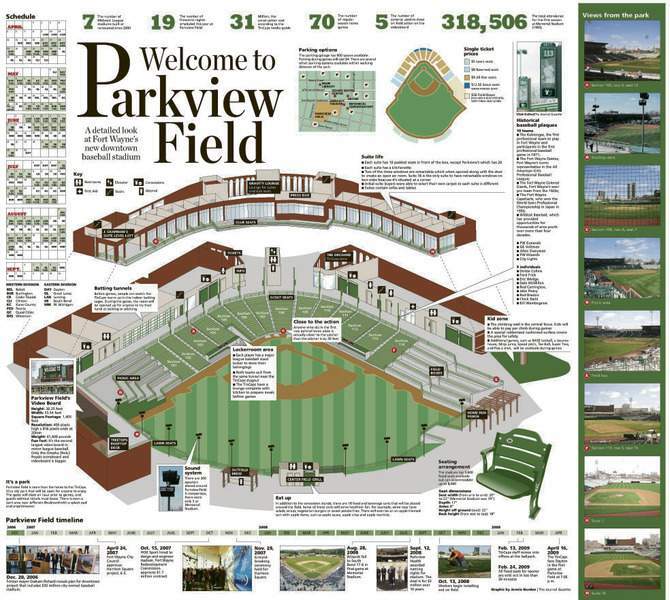 File The Journal Gazette ran a special spread on the new ballpark on April 15, 2009. 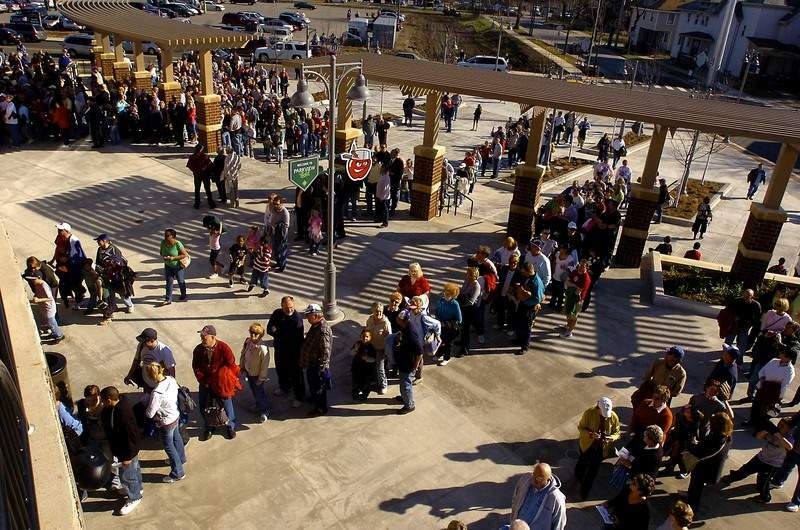 File Crowds line up on April 16, 2009, for the Fort Wayne TinCaps first game at Parkview Field. 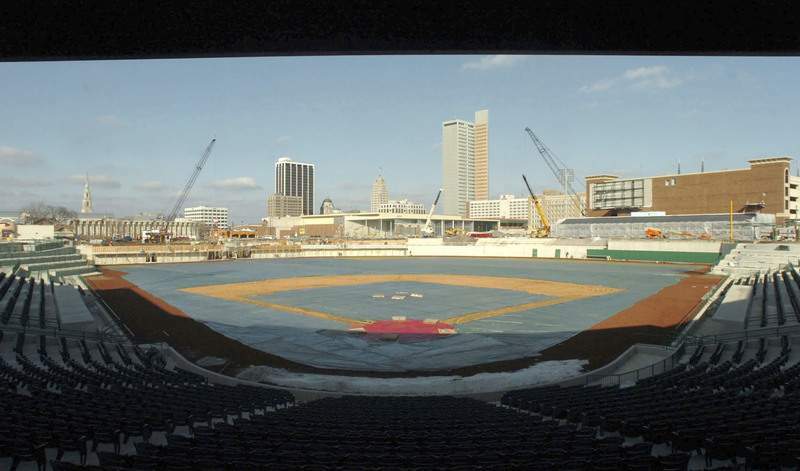 After years of discussions on the potential benefits of a downtown baseball stadium, a steering committee created by then-Mayor Graham Richard met for the first time in February 2006 to discuss ideas. By the end of that year, the city had delivered a proposal for Harrison Square, which included a hotel, condominiums and a baseball stadium. 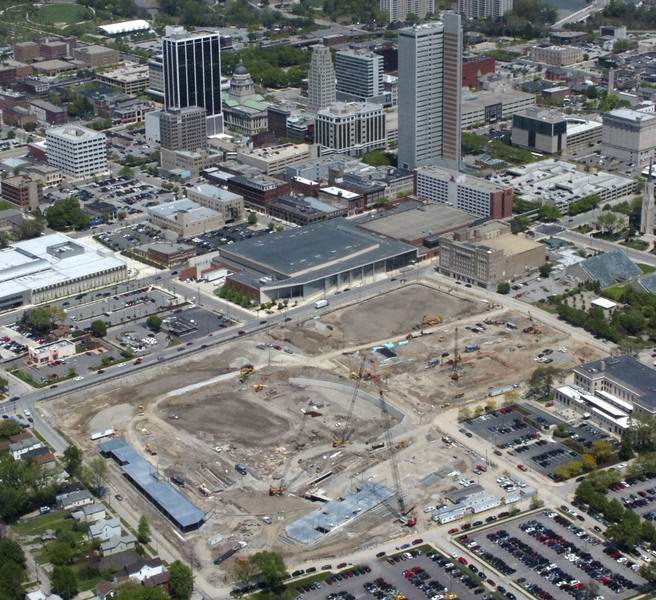 In April 2007, Fort Wayne City Council approved the downtown development, which would go through a number of changes and approvals. Work began to clear space for the project by the end of 2007 with a groundbreaking in November. In 2008, the Fort Wayne Wizards announced the organization would change its name to the Fort Wayne TinCaps in preparation for the team's move from Memorial Stadium, next to Memorial Coliseum, to the new Parkview Field. Front-office staff moved into Parkview Field in February 2009, and the TinCaps' first game was played downtown April 16, 2009. Seats for the opening game sold out in less than 30 minutes. 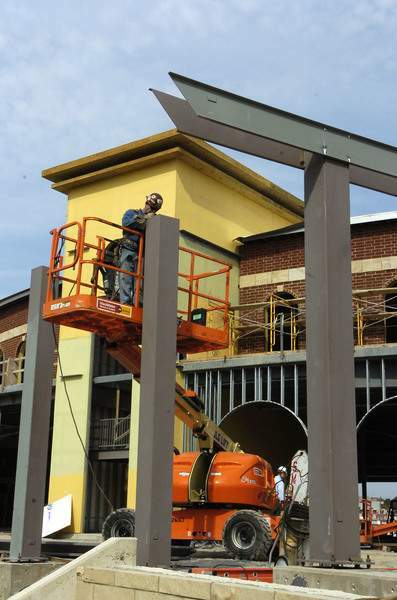 Construction had not yet begun on the condominium and retail spaces of the Harrison Square project. Parkview Field has repeatedly been named one of the best ballparks in Minor League Baseball. The TinCaps' first home game of the 2017 season is April 8. Throwback Thursday appears the last week of the month. To see more archive photos throughout the month, follow @JGFeatures on Twitter. To suggest a date or event to be featured, email cmcmaken@jg.net.